A number of people have asked us to make reproduction cancellation stamps for Feldpost letters, either to add realism to "mail call" at a living history event or to create letters to add a personal touch to an impression. 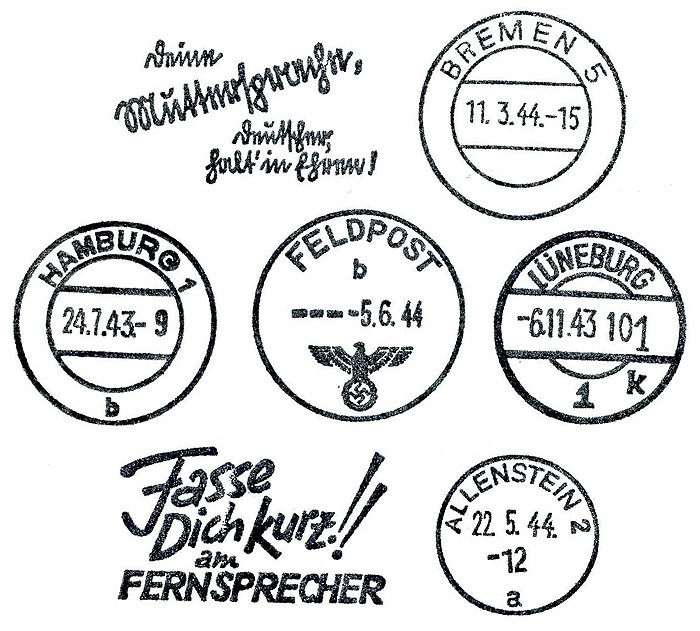 We have created a set of Feldpost cancellation stamps we offer as a sheet of unmounted stamps but we also can make unique stamps with custom information, dates, etc. as needed. While there were countless variations and exceptions to every rule, there were two main types of cancels used on Feldpost letters during the war: cancels for letters sent from home to the front, and cancels for letters sent from the front to home. Letters from home would generally have been cancelled with a normal civilian-type cancel with the name of the city or town from which the letter was sent. 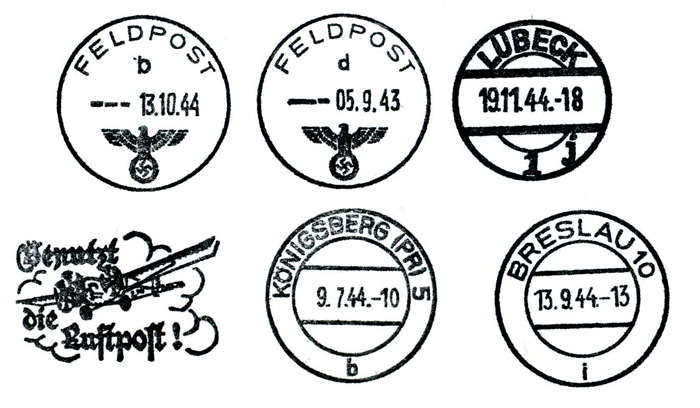 Letters sent from the front would be marked with a military "FELDPOST" cancel with the national eagle, these letters would generally also be stamped with a unit stamp for the sender's unit- usually a stamp using the unit's Feldpost number, if the unit was assigned one. Note that the cancels for Allenstein, Bielefeld, Bremen and Koenigsberg are "fancy cancels" with additional graphics as shown. We also have the military Feldpost cancel stamps, those shown here are from September 1943 and June and October 1944, although I could make any date required. The scans shown are scanned from stamp impressions made with my reproduction stamps, they are perfect copies of the real thing. As with all my stamps, they are made from high-resolution artwork and laser etched for maximum detail, and are exactly the same size as the original stamps.